JJ Vulopas lives in the Land of Can. For this Wharton student, author and entrepreneur, milk and tree nut allergies are not limitations, but opportunities to make a change in the world. JJ is on a mission to put kids with food allergies on the map, inspiring them to advocate for themselves through his children’s book, Land of Not. As his characters learn to focus on what they can do, the book teaches a lesson we could all learn — you are who you are, not who you’re not. Follow JJ on Spokin @jamisonv to see all of his 25 recommendations! Tell us about the Land of Not. The book takes place in a ridiculous fictional land called the Land of Not. In the Land of Not, everybody is defined by what they can’t do. The main character cannot eat nuts, and he feels trapped by it, until he meets someone from the Land of Can. In the Land of Can, there are no limitations, just opportunities. All of these kids start doing what they love to do, and the positivity is infectious. For a long time, I defined myself as a kid who couldn’t eat certain foods, but that is such a small part of who I am. I wanted to capture what I felt going through elementary school with severe food allergies and basically wrote what I wish someone had screamed in my face when I was a kid: “Who you are is enough.” Whether kids have food allergies, learning disabilities or just have trouble being positive, this book is for them. Spokin Tip: We love this book and couldn't wait to share — get your own copy here. Where do you get your positivity? I remember coming home from a failed food challenge when I was nine, and I started crying in the car because I was so let down by the challenge. My parents pulled into a supermarket parking lot and my mom said, “JJ, here’s another food challenge. Let’s count all of the foods in here that you can eat.” We went inside and started counting — I lost count after aisle three. My sense of “can” was born in aisle three, and it’s grown ever since. How are you are (literally) putting kids with food allergies on the map with your book? We’ve designed a map of the Land of Can for allergists, pediatricians and schools that accompanies the book. Any child, not just one with allergies, can fill out a sticker with his or her name and something they can do, put the sticker up on the map and sign the “Can Constitution.” I developed this concept with individuals from the psychology department at Penn who study the benefits of a strength-based mindset, which is extremely helpful, especially in doctor’s offices where kids need the positive emotional support. Speaking of maps... how do you manage traveling with food allergies? This past spring break I went to Mexico City with friends. This was my first independent international trip, so my parents were really nervous, but I was really proactive. I called the airline in advance, emailed the hostel and identified safe restaurants (before I knew about Spokin!) in the area— my mom still made me pack a bag full of safe granola bars just in case. Thankfully I could speak enough Spanish to help cross the language barrier. More recently, I just took a trip to D.C. and Virginia, and the ability to search for safe restaurants on Spokin wherever I went made it so easy to find safe options. I searched “D.C. restaurants” and found several restaurants that other Spokin users had recommended. I especially liked the relevancy score which shows how other people with my food allergies rated a restaurant – that is really valuable. As a college student, how does Spokin make your life easier? Spokin allows users to go anywhere and realize what they can do. When I first opened up Spokin, it felt like a magic moment of “yes.” Everything I saw was a solution — one possibility after another of things that could work with my allergies. In the food allergy world, it is easy to focus on the things you can’t do. Spokin is changing that. Spokin is the Land of Can, and I get to carry it with me wherever I go. Pizza and college seem to go together — how do you handle that with a milk allergy? I remember reeling about this towards the end of high school. Avoiding the pizza myself wasn’t what I was worried about, but it was the thought of walking into my room and seeing my roommate’s friends sitting on my bed with a large pepperoni and breadsticks. I had a heart-to-heart with my roommates at the start of the fall semester, and I was fortunate to have awesome and accommodating roommates. Any snacks you always have on hand? One benefit of a dairy allergy is that it kind of forces a healthier diet (except for the Oreos and fruit-flavored Pop Tarts). I eat a lot of natural food like fruits and eggs, but when I’m looking for a snack, I love Enjoy Life products! I keep a constant supply of their Soft Baked Minis line in my dorm room. Best food allergy-friendly restaurant around campus? 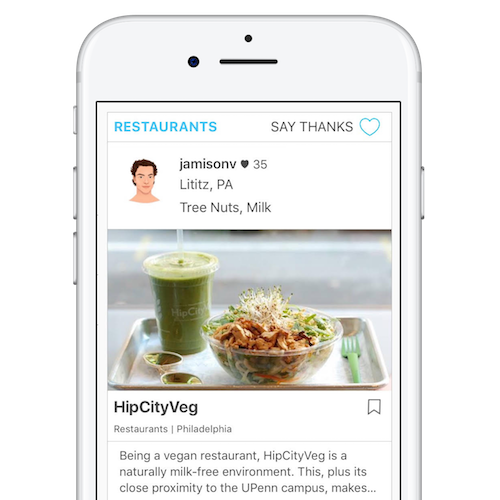 My go-to restaurant at Penn is HipCityVeg on 40th. I was ecstatic to find a dedicated milk-free spot so close to my dorm. I’ve eaten more Banana Whips in the last two years than I have bananas the first eighteen. For any Wharton students with food allergies who have additional questions, JJ is happy to help! If you would like to be connected with JJ, email Spokin at susie@spokin.com. I went to Beijing Schezwan, a local Chinese restaurant, hundreds of times growing up. They’ve since remodeled and changed their name to Kanpai Asian Kitchen. It's delicious food with wonderful staff who are always willing to accommodate. What is your long-term vision for Land of Not, and how can readers support you? I want to have the book and the Land of Can map in every school, pediatrician’s office and allergist’s office in America (is that too ambitious?). You can help spread the message by purchasing the book and wall map for your child, loved ones, teachers, librarians, school nurses, allergists, pediatricians, daycare providers and anybody who can benefit from hearing this message. We even have personalization options available to further reinforce the messages of the book! I truly believe there's a lot we can do together. Visit thelandofnot.com to learn more. Follow us on Twitter @thelandofnot — there are going to be a lot of opportunities for involvement in the near future, and this is the best way to keep up to date. We know your work will inspire so many people. Who has inspired you? My family. How my parents were able to manage my allergies (before ingredients statements were even labelled in grocery stores!) is a feat that motivates me every single day. I also have a little sister whose commitment to keeping safe also humbles me constantly. I’m currently working with a director in Los Angeles to create a documentary series, All We Can Eat. We’ll be traveling to different cities, where we will interview a resident with allergies and introduce them to a top chef in the area. The chef will then make region-specific food that is safe. We begin filming next month!